This low carb dinner turned out so fabulous that I thought I’d share the recipe with you in detail. 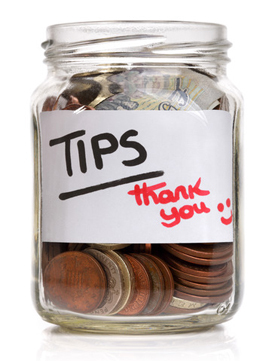 I’ll also include some helpful tips & my personal modifications to the original recipe – plus other ideas/replacements you can use. 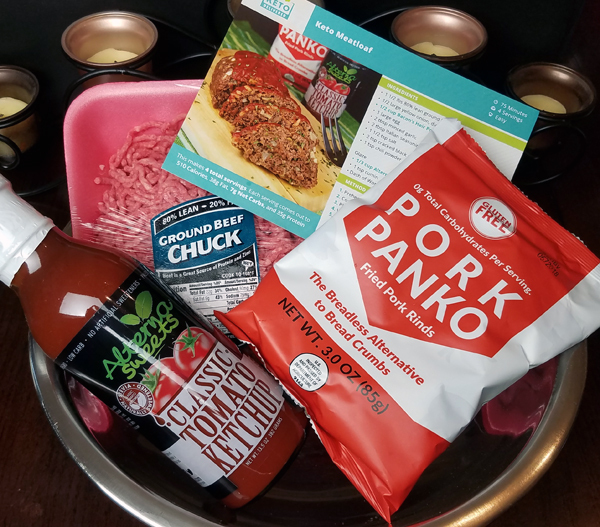 Here are the three base ingredients I used to make this Low Carb Meatloaf recipe: Pork Panko, Ground Chuck and AlternaSweets Keto Ketchup. You can also get the Pork Panko at Netrition. 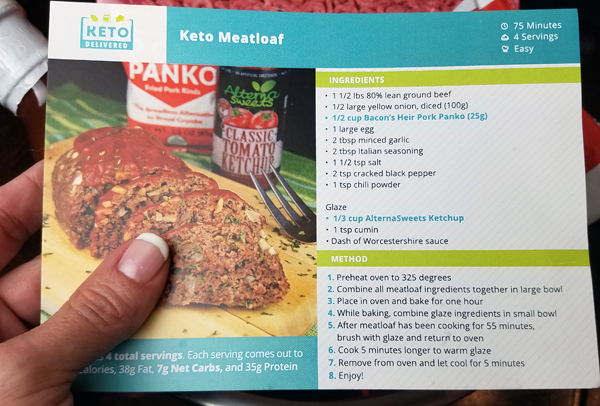 I decided to make this recipe because the main ingredients and the recipe card all came together in the April Keto Delivered Box, making it super easy! 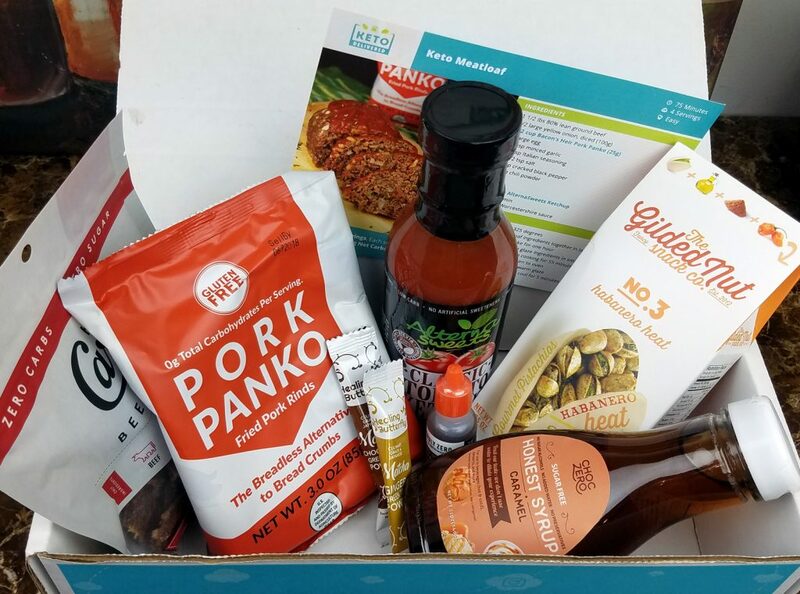 Keto Delivered is one of three Keto Subscription Box services I’ve reviewed. 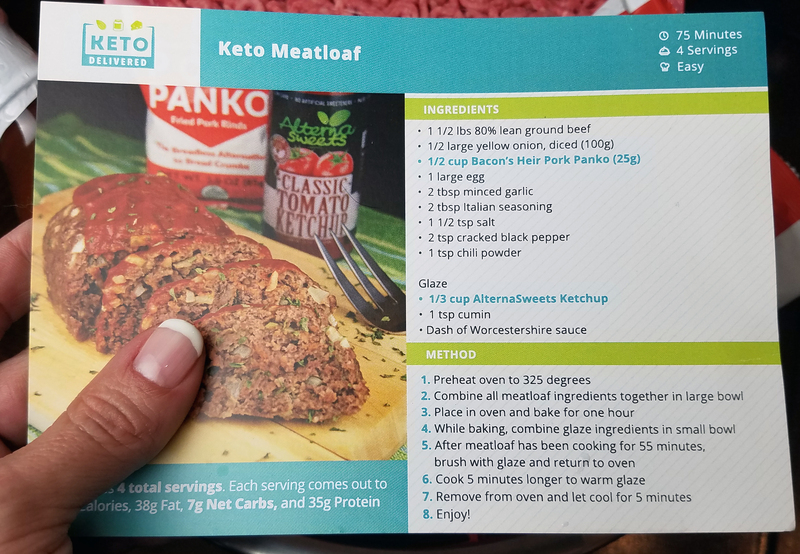 You can see my Keto Box Comparison here to learn more about all three. I mentioned in this post that Keto Delivered now adds even more low carb products to their monthly boxes! I thought it was a little strong on the Italian seasoning personally, so next time I’ll use less of that and maybe add some spinach also. I chose to leave out the half of a large yellow onion, and used 3 TBSP of mild chunky salsa instead – using mainly the chunky part (without much of the liquid). 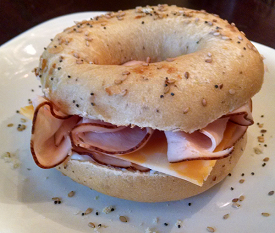 It turned out amazingly delicious! I used two bags of frozen cauliflower and boiled it first to soften it, then drained it in a strainer. TIP: after you drain it well, go ahead and mash it IN the strainer to mash out the excess water. 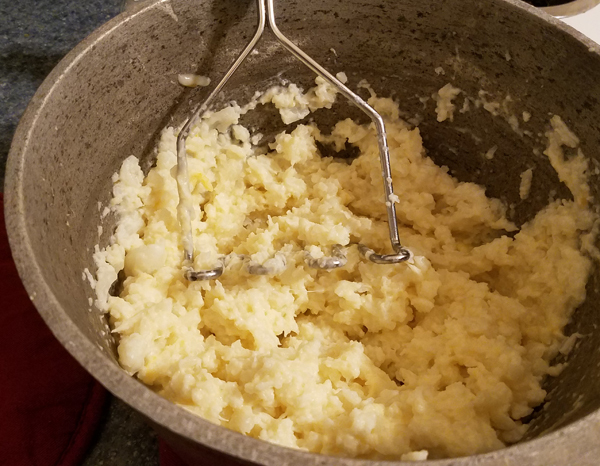 Once you mash out the extra water, return it to the hot pan and continue mashing it – or for creamed cauliflower, use a hand mixer. 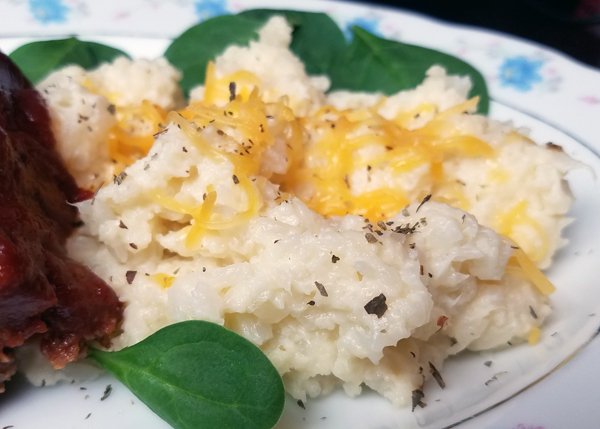 I prefer mashed cauliflower and also added: 2 TBSP Daisy brand full fat sour cream, 2 servings of shredded cheddar cheese and 4 TBSP of real butter – plus salt to taste. 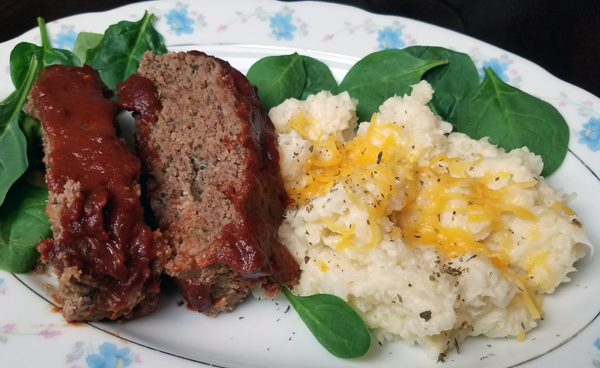 The original recipe card (above) said the meatloaf would make 4 servings and come to 7 net carbs per serving. I cut mine into 4 servings, which were large servings to me, but mine only came out to just over 3 net carbs per serving. 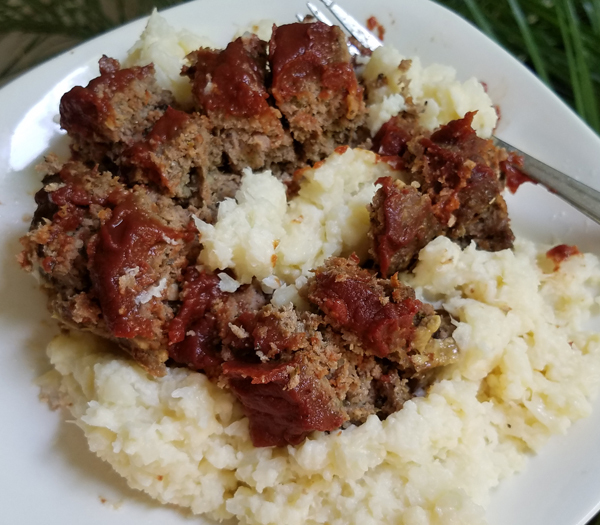 I used the free MyFitnessPal Recipe Calculator to put in all the ingredients I used for both the meatloaf and the side dish, based on my own brands/labels and amounts. This was an absolutely delicious low carb meal though! 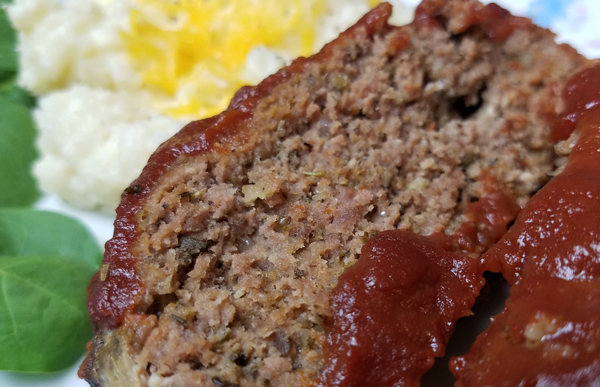 Not really being a fan of ketchup, I would normally top a meatloaf with chunky salsa instead. I would also use spinach + an extra egg as the binder, but I wanted to try the Pork Panko this time – and it was delicious! 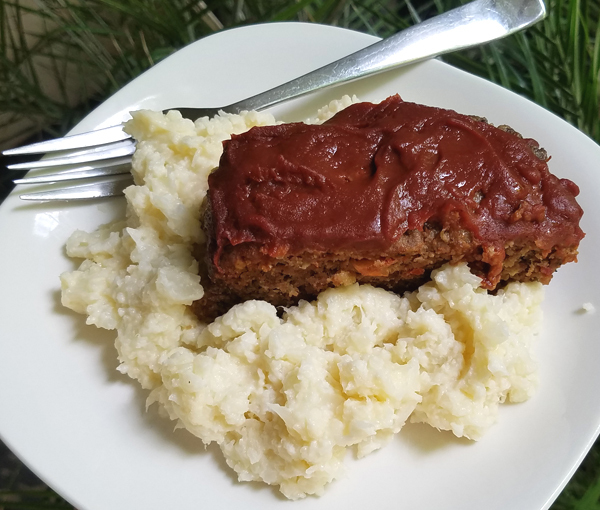 I haven’t had meatloaf in ages, so this dinner was a real treat! I never would have thought to make it if I didn’t get those ingredients and the recipe card all together in my April Keto Delivered Box. I was cooking for one, so I ended up having to eat this for FOUR meals lol. I invite Aaron over for dinner sometimes, but he doesn’t eat beef OR pork, so I ended up having to eat the entire meatloaf myself. 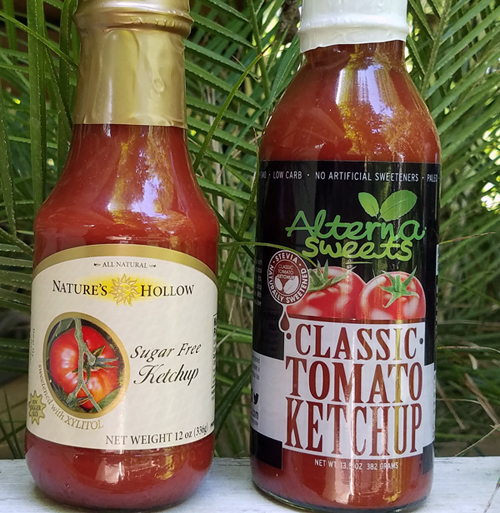 Have you tried the AlternaSweets Keto Ketchup or BBQ sauce yet? I don’t usually eat ketchup, or many sauces actually other than ranch dressing for dip, so I’m curious how it compares to other brands in your opinion. It was as good as everyone on Instagram said it was, so next I think I’ll use it in place of the barbecue sauce to make my Low Carb BBQ Spinach Burgers. New to your wonderful website. 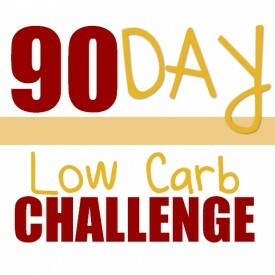 Looking forward to emails & carb conversation! I live in Canada and I can’t find pork panko pork rinds any where, I can’t even find regular pork rinds, What can use instead? Thanks I will try that sounds delish.